A hotel recommended by Dracula himself was definitely a place I wanted to visit. Luckily for me The Hotel Coroana de Aur, (The Golden Crown Hotel), which did not exist in Stoker’s time, has since been built in Bistrita to capitalise on the burgeoning popularity of Dracula tourism. As I arrive at The Hotel Coroana de Aur, I cannot help but feel that I am stepping into gothic literary history. At first the foyer of the hotel seems like any other until I spy the Dracula and Bram Stoker postcards, the hotel stationary which features Bram Stoker’s face and the store selling a variety of vampire paraphernalia. There is also a Jonathan Harker Salon. As I step into my room I am disappointed to discover that they are standard hotel style, with barely a hint of the vampiric. But my disappointment is allayed the next day when I take breakfast in the Jonathan Harker Salon. Draped in the traditional vampire colours of black and red, and decorated with animal heads, flying bats and dripping candelabra the salon offers a feast for the eyes as well as the body. Devouring a sumptuous buffet breakfast, surrounded by such paraphernalia, is a real gothic treat. I am reluctant to leave the salon, but equally eager to continue my journey. Following in the footsteps of Jonathan Harker, my next destination is the famed Castle Dracula. The road from Bistrita to Piatra Fantanele is the same road described by Stoker over a century ago. The long journey takes in the Borgo Pass, the place where Jonathan meets the horse drawn carriage of Count Dracula. After a long and fearful journey, Jonathan reaches the dreaded Castle Dracula. But I enjoy a relaxing car trip, not to a haunted castle, but to a modern hotel. The Hot el Castel Dracula is another hotel created to take advantage of Dracula tourism. Built where Dracula’s Castle is described in the novel, the hotel is a curious construction. The strangely greyish purplish building is both gothic and comically vampiric. There is even a cemetery on the grounds. A small market on the hotel grounds stocks local souvenirs and Vlad Ţepeş and Dracula memorabilia. The hotel lobby also stocks an assortment of Dracula gifts. After freshening up, the staff offer me a guided tour of Dracula’s Dungeon. I’m excited as I slowly walk down the stairs into the candlelit room. There is a coffin in the corner and I move forward to take a closer look. The staff have a surprise for me which I won’t reveal, but I screamed, loud and hard, but not before swallowing a few Aussie curse words. The staff are ecstatic at my response and after I catch my breath, we leave the dungeon for the next unsuspecting guest. After dinner I return to my room which boasts beautiful views of the famous Carpathian Mountains. I sit and drink champagne, watching as darkness creeps along the mountain tops. It’s not hard to picture wolves, and other creatures, roaming free in the mountains. Finally I retire to sleep contented on a bed whose bedhead features the dragon motif of the Dracula family. I have enjoyed following in the footsteps of Jonathan Harker, but tomorrow my journey takes a different turn. In the novel, Jonathan jumps out a window of Castle Dracula and is eventually found physically and mentally traumatised in a hospital in Budapest, Hungary. I, not surprisingly, chose a different way to end my journey. 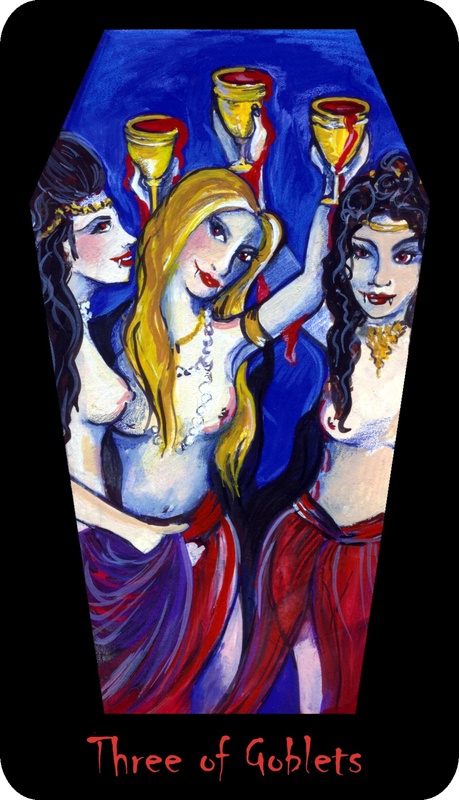 Heading for Bucharest, the capital city, I spend my final night in Romania at The Count Dracula Club, a gothic club that truly caters to the vampirically inclined. Themed rooms and a downstairs dungeon are some of the treats that await the diner. I am lucky enough to be there the night of a Dracula show when the Count himself makes an appearance. Quoting from the novel in both Romanian and English the dashing Count cavorts around the restaurant, swishing his black cape and menacing the willing patrons. The menu contains Dracula themed dishes and vampire inspired cocktails are sipped between courses. I finish the meal with a glass of ţuică, the traditional plum brandy. My Jonathan Harker journey is almost at an end. Thankfully it is not with madness and despair that I end my trip but with an evening of food, wine and entertainment. Like me, Jonathan Harker has a great love for food and drink. 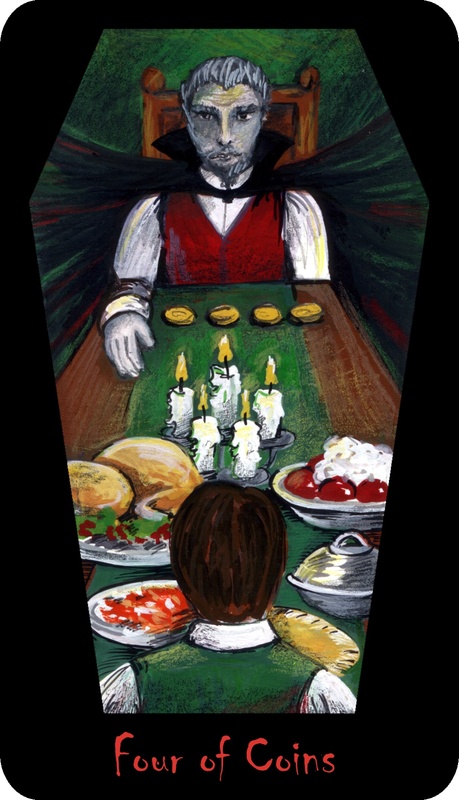 There are a number of passages in the novel where Jonathan describes the food and drink he is enjoying in Transylvania. He even writes the names of some of the dishes so he can get Mina to cook them when he gets home! When I returned from Romania I also brought home a love of Romanian food and a deep desire to know more about this cuisine. Below is my version of the classic Romania breakfast dish that both Jonathan and I ate and loved in Romania. 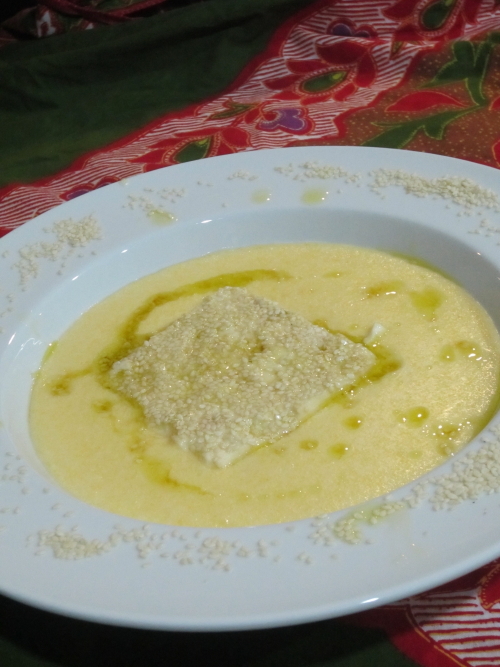 Romanian cornmeal porridge with honey and sesame baked feta. Drain feta and dry with paper towel. Pour half the oil in the bottom of a baking dish. Place feta side by side in the dish. Drizzle with remaining olive oil and honey. Bake for 10-15 minutes or until the feta is soft but not melted. While feta is baking bring the water and milk to a low boil in a saucepan. Add the salt and stir through. Pour the cornmeal in a slow stream then turn the heat to low. Stir with a wooden spoon until the mixture is smooth and thick, about 10-15 minutes. Place cornmeal in bowls and top with baked feta. A friend of mine told me she is going to Romania this November. I am so excited for her as I think she will love it. While talking to her, the memories of my own trip to Romania nine years ago flooded back. I thought I would share what I wrote about it all those years ago. The first Dracula is the historical fifteenth century Prince and warrior Vlad Tepes, aka Vlad the Impaler, aka Vlad Dracula. While not a vampire himself, nor associated with any vampire mythos, Vlad Tepes is a colourful figure who has associations with many parts of Romania. His main haunting ground is the area of Romania called Wallachia. The second Dracula almost needs no introduction having been created by Irish author Bram Stoker in his nineteenth century literary masterpiece Dracula. Loosely based on the figure of Vlad Tepes, the famed vampire count has been a part of popular culture ever since. 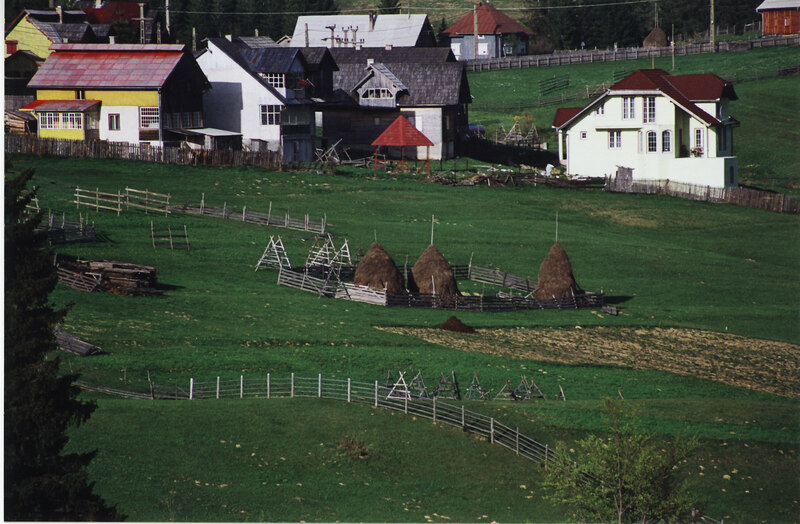 His main Romanian stalking ground is in the Transylvanian town of Bistriţa and the nearby Carpathian Mountains. As an Australian-born child of Macedonian migrants it would be natural to assume that I have cultural ties to two countries; my ancestral land and my birth land. Yet even though my parents entertained me with tales of the “Old Country” I have never had much interest in visiting the land my ancestors called home. That is because at a young age I developed a kinship with another country. Fuelled on a steady diet of Count Dracula movies, the place I desperately wanted to visit was Transylvania – the land beyond the forest. After decades of studying the myths and legends of the vampire, my desire only grew so I decided to celebrate my fortieth birthday by travelling into the heart of Romania with my bemused partner. After a gruelling journey involving three planes and over thirty hours in non-stop transit I finally land in my beloved Romania. The excitement staves off the exhaustion as I eagerly rush to meet my first Romanian – the guy from the car hire firm. With guide books in hand and virtually no Romanian language skills, we jump in the car. Driving on the right hand side of the road, and the left hand side of the car, appears to be no major drawback for my partner, but the giant potholes, daredevil drivers and equally daredevil horse and cart riders are some harrowing terrors we face on the drive. It all adds to the mystery of the country which, having never been to Europe is almost overwhelming in its unfamiliarity. As I relax into the drive I look out the window to observe a country that has haunted my dreams. The image of a gypsy careening at breakneck speed down the road in a horse drawn cart is so archetypal and so Romanian that I laugh out loud. Yet that image is strikingly juxtaposed with the sight of pristine green valleys vying with hideous concrete monstrosities for dominance over the landscape. The gypsies evoke the wild lands that Bram Stoker wrote about but the communist love of concrete and uniformity has certainly stained the land. In the process it has also tainted me. By the time I reach my hotel room all I want to do is cry and go to sleep, but this is supposed to be a dream holiday, so I rally my spirits and step out into Romania. No sooner do I step onto the pavement when I see a gorgeous stray dog holding a shrink wrapped sandwich in its mouth. It trots off to its lair, an ancient church in the middle of the suburbs. And that’s when I take a really good look around. Here, among the communist concrete blocks, history still survives. Like the dog nestling in the ruins, Romania’s true spirit has been buried, waiting for its time to re-emerge. For me, the dog becomes the key to understanding Romania. It shows me that behind the ugly communist façade, the spirit of the country and its people is alive and well. This is the reality of modern day Romania. It is a country haunted by a brutal past yet vibrant with future promise. It is also a land that retains a powerful link with its dark, vampiric heritage. How appropriate that the wolf’s closest ancestor, an animal with an intimate connection to the vampire, becomes my spiritual companion on this journey. With the Romanian dog as guide, I am happy to continue my journey through the land beyond the forest. 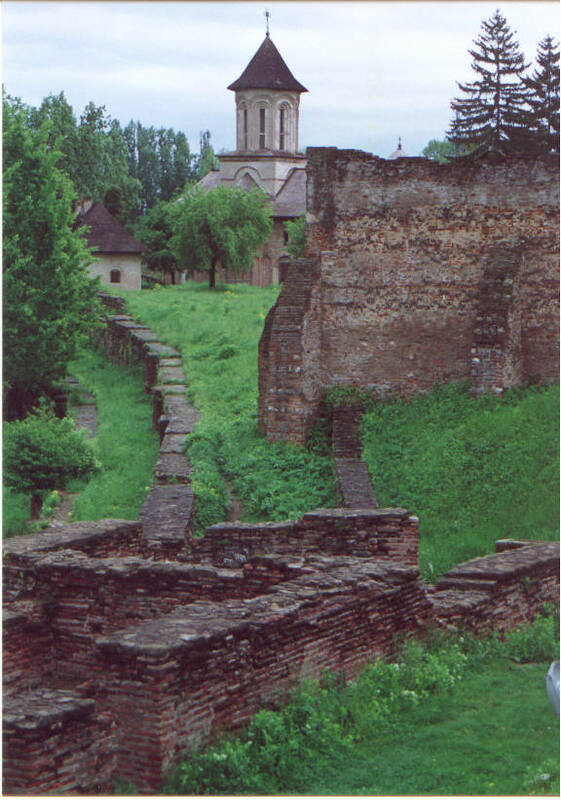 The first Vlad Tepes site we visit is The Princely Court in Targoviste. These are the first human-made ancient structures that I have ever seen. I am stunned at the constructions that have lasted over five hundred years. The archaic murals painted in the church are awe inspiring. I am so caught up in the magnificent history of the ruins that it takes me a while to comprehend that I am standing in one of Vlad’s ruling courts. The realisation that I am in a place where the real Prince Tepes once walked completely overwhelms me. His feet had once touched this earth, his hands had once touched these buildings. I am finally in the presence of the man who inspired Bram Stoker to name his infamous vampire after him. I am humbled. 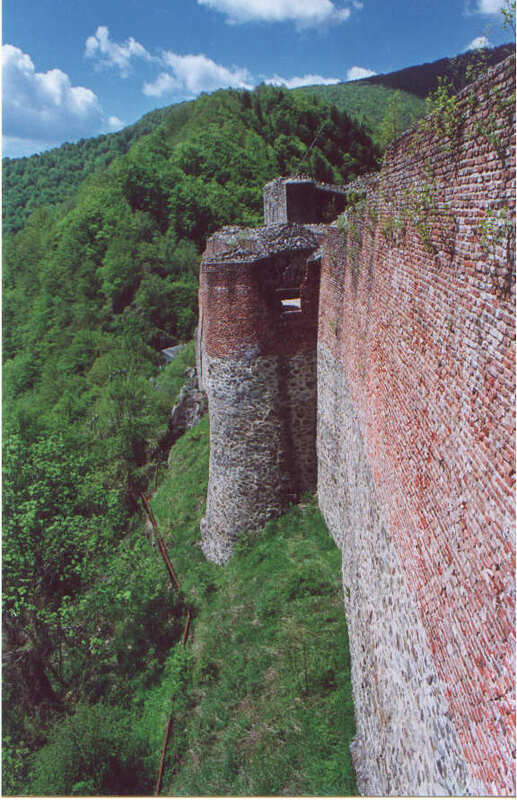 Our next stop is Citadel Poienari, the real Castle Dracula. This is the castle that Vlad Tepes actually lived in. To reach the top we must climb nearly 1500 steps, all of them uphill. For me, the climb is long and arduous. The only distraction is the surrounding forest. Ancient trees effortlessly climb the heights I seek, their tall gangly limbs swaying in the eerie breeze. Animals scurry in the bush and a field mouse runs across my path while a skink suns itself on a rock. This is the land Bram Stoker wrote about, wild, untamed and filled with life. I can almost hear the sombre howl of the wolves that still run free in these forests. After an eternity of huffing and puffing I finally come face to face with Vlad Tepes’ castle. Again I am awed by the sight. This is the castle that has haunted my dreams since childhood. I cannot believe that I am here. Once more I allow my imagination to run wild with images of Tepes ruling his kingdom from on high. Outstanding panoramic views of the countryside dominate the scene. Down below is the village of Arefu, where the proud descendants of Vlad Tepes’ minions still live. As I imagine talking to these descendants around a crisp bonfire, I realise that I have connected deeply with the Tepes site s but not with the Romanian people. The next day I stop on my way to Sighisoara to pay homage to a statue of Vlad Tepes that guards the gateway to the village of Arefu. In the distance, towering above Vlad are the ruins of his mythic castle. As I turn to leave I slip and fall right in front of the bust of Vlad. I lie there looking up at him, knowing that I have badly twisted my ankle and scraped my knee. As my blood drips into the land in the shadow of that archetypal castle, I feel that I am paying due homage to the vampire prince. A scrape of flesh and a touch of blood will be left in the Romanian soil to form a blood tie with this ancient land. As my partner helps me hobble to our car I have plenty of time to ponder the severity of my injury. The drive to Sighisoara is long and slow. We chose the Transfagarasan road where snow capped mountains and majestic forests compete with the sheer windy majesty of the concrete construction that is this road. My stress levels rise as the snow creeps closer to the car. It feels like a scene from The Shining. Just as we ponder whether to put chains on the tyres, the road stops, blocked by an avalanche of snow. This path to Sighisoara is cut-off. We have to turn around and try another route which will take us four to five hours to traverse. By now I am worried about my ankle and my enthusiasm to meet people is severely dampened. All I want is a good night’s sleep and a few painkillers. But as we finally reach the fairytale spires and cobblestone street s that is Sighisoara, my spirit is awakened. Leaning heavily on my partner and limping noticeably, I eagerly explore the craft market. Painted vampire masques and Dracula mementos vie with beautifully embroidered handicrafts and traditional souvenirs for table space. I stop and admire a delicate piece of embroidered lace, but before I can pick up the fabric, the black clad old woman running the stall waves her hands frantically, stopping me from touching the cloth. She gestures in sign language, pointing at my foot. I mime falling over and hurting my ankle. She laughs and pats my arm, gesturing for me to peruse her wares. As I wander away from the stall, I look back and see the woman pick up the only piece I had handled and make a complicated sign over it before placing it back. I recognise immediately what she is doing. She is warding off the evil eye. Even though my injury is only temporary, the old woman is taking no chances. If I am carrying a curse, she is prepared. It is a superstition I remember from my childhood. As I take a good look at the villagers I see glimpses of my aunts and uncles, my grandparents and parents. I see a resemblance to my own Slavic relatives; a connection I did not feel till now. It is both physical and mythic. I see a tabby cat that looks just like the one down the road back home, complete with feline aristocratic attitude. Slowly , unbelievably, I begin to feel at home. The bond I had so longed for is appropriately forged here. In the birthplace of Vlad Tepes, I finally connect to my ancestral roots. In the process I also connect with the Romanian people, so similar to my own family. It has taken a fall and an injury to bond with these people, but it is a price well worth paying. I enjoy a drink and a meal in the house Vlad Tepes was born in, secure in the knowledge that I too, have been reborn. Fittingly our final stop in Romania is Snagov Monastery, the burial place of Vlad Tepes. The monastery is situated on an island and the only way to get there is by boat. As we are gently rowed to the island, I cannot help but feel that I am on the river Styx, about to enter the Underworld. As a blac k robed priest greets us at the door and welcomes us into his church I am transported to my own childhood. I remember the Orthodox churches of my youth with exquisitely painted interiors, framed saints and fragrant incense. It makes me yearn for a religion I no longer practice. But my reverie is broken by the sight of the altar. At its foot is a grave on which sits a plaque of Vlad Tepes. This is his final resting place. Vlad’s decapitated body supposedly lies beneath that slab of concrete. As I solemnly stand beside the grave, the priest stands next to me and, unbelievably, poses for a photo. I try not to laugh as his irreverent reverence so reminds me of the priests I grew up with. It is a deeply moving place to visit and the perfect way to end the Vlad Tepes leg of my journey. I finally return home, but not as the forty year old Countess Dracula I had hoped to be, but as Igor, the twisted servant of the vampire. I know I am deeply changed. Romania surpassed my dreams and the reality certainly lived up to the myth. Every time I look through my photo album I am stunned at the beauty of a harsh country that I nearly failed to see. The ancient ruins and archaic Dracula sites are breathtaking. But my favourite photo is of a small stray dog with matted fur. It brings back some of my most precious memories. Throughout the trip I had expected to see the stray dogs that so inspired and enchanted me being mistreated and shunned by the locals. But I was surprised at the tender way the Romanians treat their furry comrades. The images of school children sharing their lunches with the dogs, women bending to pat them in the streets and an armed and vigilant guard inevitably surrendering to the need to play with a stray puppy are unforgettable. These experiences bonded me to the people as I had always been bonded to the land, its turbulent history and gothic mythos. Dracula brought me to this strange land, but its flora, fauna and people won my heart. I know that a part of me now lives in my archetypal homeland, and a part of my soul will always dwell in the land beyond the forest.